No one calorie counter watch is best for everyone. Compare the different features and functions, and choose a relatively accurate model that is compatible with your needs and provides the other tools you'd like to use to help control your calories and get fit. A study published in the "American Journal of Preventive Medicine" in 2008 found that people who kept track of their calories from food lost about twice as much as those who didn't do so. Some calorie counters basically just track your activity levels, based on your heart rate or the number of steps you take. Others include a whole range of potentially useful features, including monitoring your sleep and allowing you to input the food you eat so you can compare calories in versus calories out. Some watches give you instant feedback or health tips as well. None of these devices is perfectly accurate, but all will give you a ballpark figure and allow you to compare your activity levels from day to day, helping you improve. They use different algorithms to estimate how many calories you burn. If you do a lot of plyometric activities, such as jumping exercises or burpees, a calorie tracker watch that includes a heart rate monitor may be more accurate. 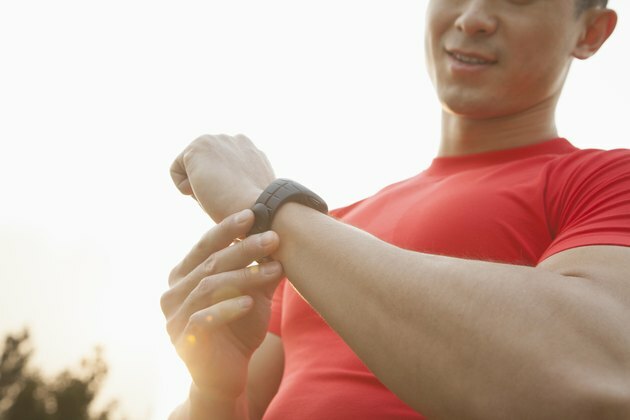 The watches that rely mainly on GPS tracking won't register the extent of the activity you're performing, according to an article on the Wired website. Check to see which fitness apps and other types of devices your calorie tracking watch is compatible with. Some are only compatible with Android devices or iOS devices, so if you use another type of device you won't be able to get the full functionality. Likewise, if you use a food or exercise tracking app, purchase a calorie tracking watch that is compatible with it so you don't have to enter all your information multiple times. If you find your new fitness toy inconvenient, it won't be very long before it winds up lying unused in a drawer. Rechargeable batteries enhance the convenience of these watches, as does long battery life. Other helpful features include results you can see on the screen without having to download info to a computer, and being able to wear the watch anywhere, even in the shower. Your watch should also be comfortable on your wrist. What Is a Fit Test on a Lifecycle Treadmill?